Chickpea Flour (24%), Rice, Potato Starch, Rapeseed Oil, Corn Flour, Creamy Dill Seasoning (7%) (Dried Glucose Syrup, Rice Flour, Dextrose, Salt, Onion Powder, Yeast Extract Powder, Sugar, Natural Flavouring, Citric Acid, Herbs (parsley, dill), Spice (dill seed)), Salt. 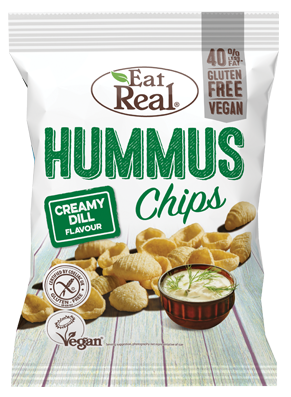 From humble chick pea to crunchy crispy chip, the creamy dill flavour will tickle your taste buds and help you experience that flavour and melt in the mouth sensation. Modelled after a Mediterranean yogurt-based dip, the zesty taste of dill infuses magically in creating a cool refreshing taste.